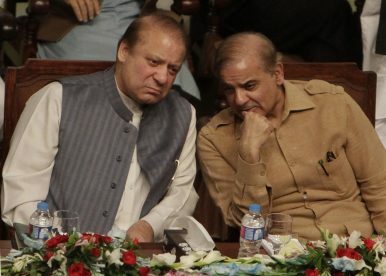 Former Pakistani Prime Minister Nawaz Sharif, left, listens to his brother Shehbaz Sharif during a party meeting in Lahore, Pakistan (Oct. 4, 2017). To become prime minister, the long-time ruler of Punjab must overcome his family’s scandals. The upcoming elections in Pakistan are a battle between candidates who have waited long years for the opportunity to become prime minister. Shehbaz Sharif is one such candidate. He has delivered in Punjab as its chief minister for the past 10 years. The province has flourished under his governance, but the recent scandals and verdicts against his elder brother and his family have put the image of the party in jeopardy. Will he be able to defend his party at this stage and become the next prime minister of Pakistan? Mian Mohammad Shehbaz Sharif, born in 1950 in Lahore, is the younger brother of Nawaz Sharif, former prime minister and former chief of the Pakistan Muslim League-Nawaz (PML-N), a party which has a stronghold on Pakistan’s largest province, Punjab. He and his brother Nawaz jointly inherited business interests in the Ittefaq Group from their father. Sharif’s political career began in 1988, when he was first elected as a member of the Punjab Assembly. In 1990 he chose to run for a National Assembly seat and won. Sharif climbed the ranks fast, becoming the opposition leader in the provincial assembly (to which he had returned after the National Assembly was prematurely dissolved) between 1993 and 1996. In 1997, Sharif became the chief minister of Punjab. This position was short-lived because of the military coup by then-Army Chief General Pervez Musharraf, who exiled the Sharif brothers to Saudi Arabia in 1999. In 2002 and 2006, Shehbaz Sharif was elected president of the PML-N while in exile. After returning to the country in 2007, he became the chief minister of Punjab in 2008 for the second time. In March 2012, Sharif was elected president of the PML-N’s Punjab chapter and in 2013 he was elected to the Provincial Assembly of Punjab for the fifth time, making him the unopposed chief minister of Punjab for the third time. The PML-N plays its politics on the basis of progress in Lahore and Punjab, which can be credited to Shehbaz Sharif and his governance. But the party’s fate took a turn for the worst on April 4, 2016, when the Panama Papers leaked. Among the revelations in the massive trove of documents was information naming Nawaz Sharif as the owner of two offshore companies through his children. In July 2018, Pakistan’s Supreme Court disqualified Nawaz Sharif from holding public office because he had not been honest in declaring his finances. This paved the way for now PML-N Chairman Shehbaz Sharif to lead the party on a national level. This might be the only chance for Sharif chance to prove himself credible to rule the country. The election will likely be won or lost in Punjab, Sharif’s home ground. Punjab holds the majority of National Assembly seats, and thus Imran Khan, the leader of Pakistan Tehreek-e-Insaaf (PTI), is also eyeing it for the upcoming elections. The key question is whether Sharif’s record in Punjab is enough to entice voters to overlook the scandals swirling around the PML-N.
Shehbaz Sharif is known for his enthusiastic and workaholic nature. This was the Sharif government’s second term in Punjab, and he aimed to make the province an educated, industrialized, and economically stable province, and has mainly focused his efforts on transportation and power infrastructure over the last five years. Known for his love for infrastructure development, Sharif has heavily invested in the construction of transportation systems, which includes mega projects like inter-city rapid transport systems, highways, and rural road development. Under his rule, the Orange Line, the first of the Lahore Metro was initiated but is yet to be completed. Sharif claims that the metro will revolution transport in the city. The government has been keen to invest in the IT sector of the province. Its Digital Punjab project has funded over 200 interventions in sectors like agriculture, law and order, process automation, health, citizen-centric development, and education. Meanwhile, the security and the terrorism situation has considerably improved due to the induction of new civil security forces and the formation of the safe city project. Two new anti-terrorism courts have also been established in the province. According to the Punjab government’s promises and progress report (which was seen by The Diplomat), murder and kidnapping has gone down by 30 percent and terrorism by 83 percent. According to Alif Ailaan, a nonprofit, Punjab’s education system has outperformed all other provinces. The education budget increased by nearly 50 percent between 2013-2014 and 2017-2018, according to a report from the group. Among other things, the provincial government spent a recorded 28.5 billion Pakistani rupees ($234 million) on scholarships to about 350,000 students. The Punjab government is especially famous for distributing laptops to scholars. Finally, during Sharif’s second term, particular attention was given to the grievances of women of the province, including setting up the Punjab Commission on Status of Women (PCSW). The major criticisms Sharif’s government faces stem from charges of misplaced development priorities, lack of social development, and an unusual fixation on large projects for political reasons. The largest investment in the province, for the construction of the Orange Line Metro, has been funded by Chinese loans worth $1.65 billion. The project was controversial from the start and is still not fully equipped to run. PML-N progress documents claim landmark savings through transparent procurement has saved 75 billion rupees in the Orange Line Metro project but critics still argue that this loan has added to the ever-growing burden of foreign debts on the national economy. The provincial economic growth rate has risen only marginally under Sharif’s guidance – to five percent in contrast to an average of 4.4 percent between 2005 and 2016. That’s short of the target set by the Punjab Growth Strategy 2018 of eight percent per year. The strategy also aimed to create over a million jobs each year and push private investment to $17.5 billion, which would boost exports by 15 percent. On the contrary, exports and private investment have declined significantly during Sharif’s second term due to high energy costs. Meanwhile, the job market has added mostly low-quality, low-paid or semi-skilled jobs, according to experts. Finally, agriculture is the driving force of the province. However, even though the provincial budget provides for subsidies for agricultural productivity, this part of the budget has not seen any significant increase. Punjab’s government draws its political power from the central districts of Punjab (namely Lahore). The southern districts face a shortage of social and economic infrastructure. The undeniable favor shown to some district of the province has created a regional divide within Punjab. Recently, during a meeting, Sharif rebuffed these charges. He claimed that his party dedicated billions of rupees, 10 percent more funds than prescribed by its population, for the betterment and prosperity of the far-flung areas. The Punjab government enthusiastically defends its performance, maintaining that Punjab is a more developed and a better-governed province than it was in 2008. Sharif’s record in Punjab will have to not only speak for itself, but outweight corruption scandals plaguing his party and family. His brother Nawaz has now been sentenced to 10 years in prison for corruption. Shehbaz Sharif himself appeared before the National Accountability Bureau (NAB) on July 4 for corruption cases linked to the Water Filtration Company for the rural areas and Punjab Saaf Pani Company (PSPC). Four billion rupees have been spent on the PSPC, which was set up to ensure a supply of potable water to rural areas, but there is no evidence of any on-the-ground progress, according to the council. Another alleged 200 billion corruption case has been taken up by NAB related to the LNG export contract with Qatar, public housing schemes, and energy projects. The Diplomat tried to contact the PML-N for a comment but received no response to repeated calls. Politics in Pakistan is unpredictable and given the current sentiments, it might be hard for Sharif and family to prove their continued worth. The PML-N’s election 2019 manifesto has made similar promises as it did in the past. That may make it hard for Sharif and his party to overcome the many corruption cases entangling the party leaders, as well as past failed promises. In addition to his political opposition, Sharif will has to overcome the corruption allegations, disapproval from the establishment, and some bad decision-making of his own. These combined trends have put Sharif on the spot will a little over a week left before the polls. But Sharif continues to be optimistic, showing trust in his voters’ supports. July 25 will prove whether the electorate also trusts in Shehbaz Sharif.